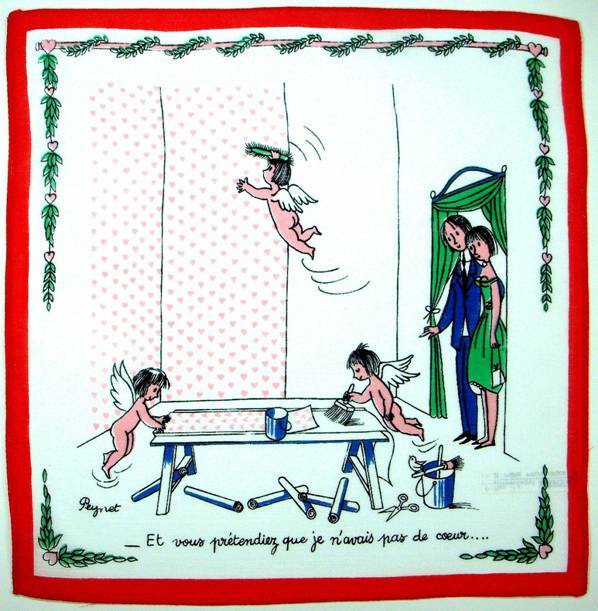 Raymond Peynet knew, and expressed it exquisitely in his enchanting and often humorous drawings. You’ve seen his work here before in our romantic musings and New Year’s greetings. 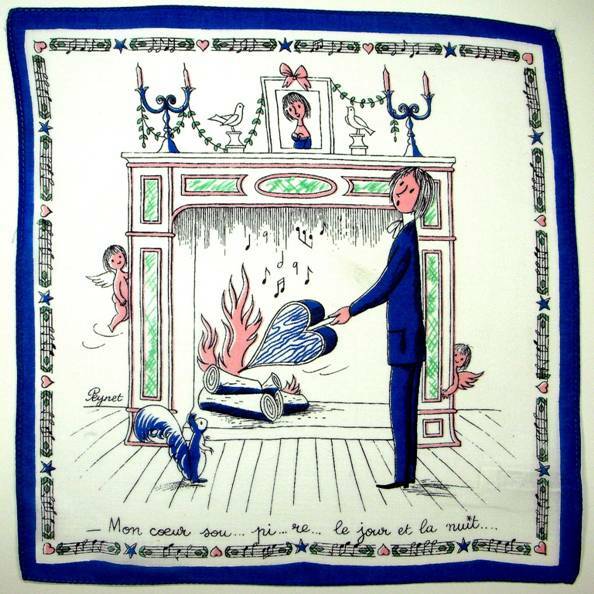 Born in Paris in 1908, Peynet entered the famous École des Arts Appliqués at the age of fifteen. There he met fellow design student Denise Damour, who would one day become not only his wife, but the locus of his famous images. 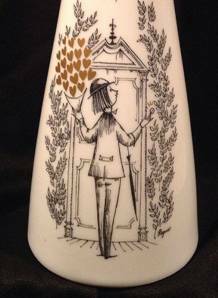 He began his career working as a draftsman for Tolmer, a Paris advertising agency, where he designed everything from labels for perfume bottles to biscuit tins. He also began publishing his drawings in Le Rire, Rire à deux, Paris Magazine and The Boulevardier. When war broke out, Peynet moved his family to Auvergne where he worked as a war correspondent. there, in 1942, fate intervened, and Peynet’s life took a serendipitous turn. Asked to deliver a confidential document to a fellow correspondent located in Valence, in the department of the Drôme, Peynet was waiting on a bench opposite the music kiosk. There, he witnessed a long hair violinist sweetly playing, while a female admirer looked on, enraptured. (Note she is knitting his musical score!) 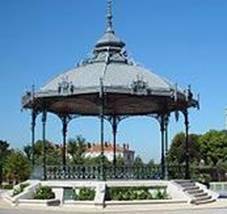 Today the Kiosque Peynet is an historic landmark. 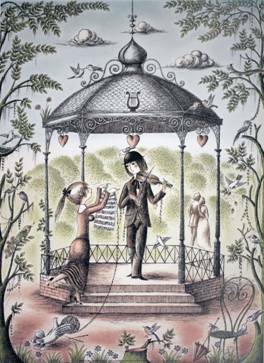 In later years, Peynet replaced the image of the violinist with a poet, and the girl became his lover. 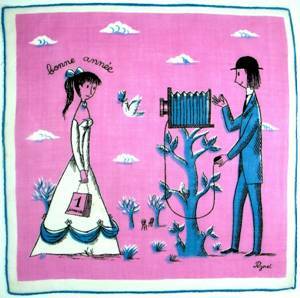 Les Amoureux de Peynet was born. 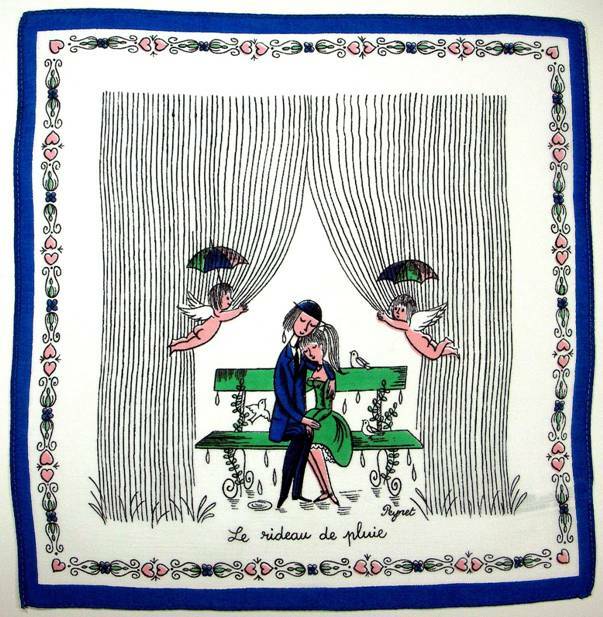 Soon images of the popular lovers began appearing in magazines like Elle and Paris Match, on posters advertising Air France, Galeries Lafayette, as well as various film studios, album covers, wine and champagne labels, scarves, handkerchiefs and in a series of porcelains by Rosenthal. 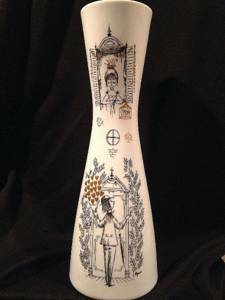 Below, the ardent suitor rescuing the damsel in the tower, perfectly resonates with the contours of the vase. Note he gifts her not with flowers, but golden hearts of love. Perfection. 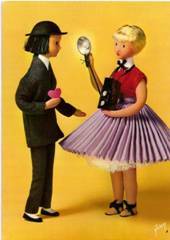 Peynet produced a series of over 200 dolls of the lovers. When Queen Elizabeth made her first official sojurn to Paris in 1957, she was presented with 12 Peynet dolls as a gift for Princess Anne. So popular was Peynet, the French chose his figures to represent the spirit of Paris on this occasion. Although mademoiselle’s wardrobe contains décolleté and shoulder bearing styles, along with flirty feminine shoes, the figures are still charmingly wholesome. Note the poet comes with love in hand. 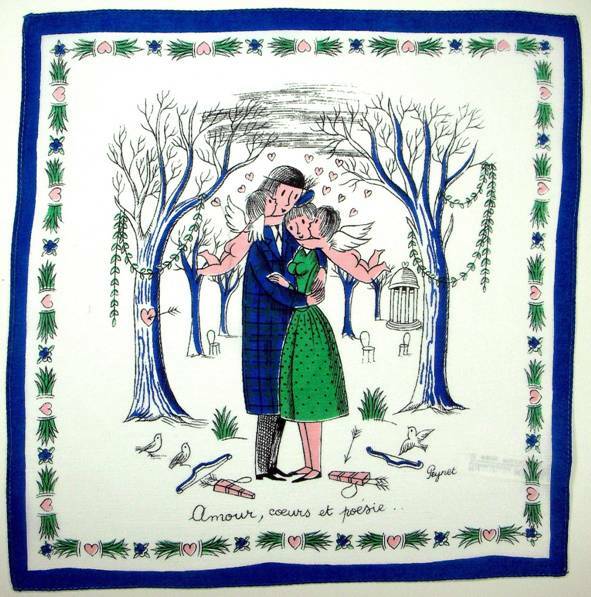 “Les Amoreux” were so well known they inspired not only songs by Geoerge Brassens and Marcel Amont but an animated film in 1975 Le Tour Du Monde Des Amoreux (Around the World with Peynet’s Lovers). Ardent cupids zing arrows of passion to the smitten couple in “Love, Hearts and Poetry.” Note the music kiosk in the background. This shy couple rendez vous neath a large clock, whose hours on its face progress from a little affection to beacoup, to all out passion to – ooh-la-la, madness! My friend Claire who translated for me explained this corresponds to our American version of “Loves me, Loves me not.” There is no equivalent translation. In French, they say, (much like the clock face) “il m’aime, un peu, beaucoup, passionnément, à la folie” – He loves me a little, a lot, passionately, madly. 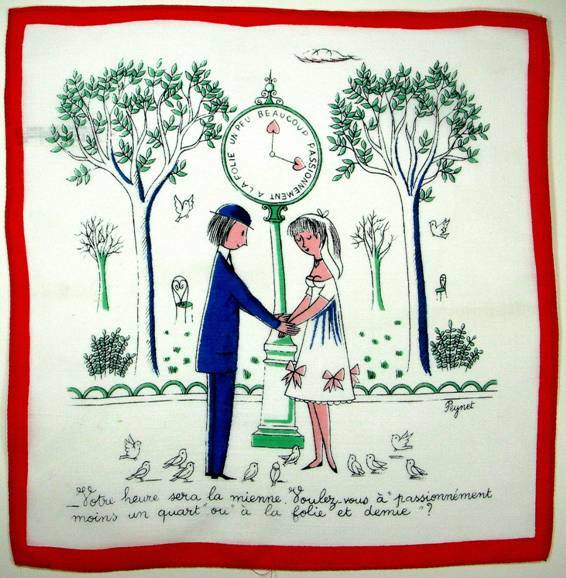 This hankie might translate: “Your time will be mine. Do you want passionately on the quarter hour or madly on the half hour.” Hmm. Can I have both? 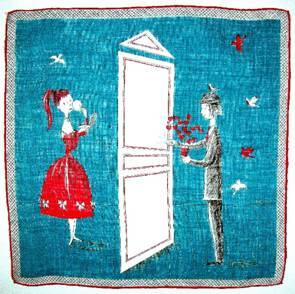 This hankie translates “Look! 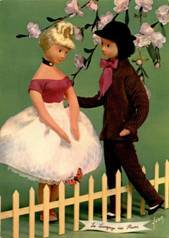 Your poet accompanies you” as he adorns her frock with flowers. “Mon coeur soupire le jour et la nuit” – “My heart sighs day and night.” This poor chap will probably burn the place down as he eagerly fans the flames while focused on a portrait of his beloved. According to the internet, four museums are dedicated to Paynet: In Antibes, in Auvergne, in Karuizawa (Nagano, Japan) and Mimasaka (Okayama, Japan). Peynet books include The Lover’s Pocket Book (1954) The Lover’s Bedside Book (1956), The Lover’s Keepsake (1958), and The Lover’s Weekend Book (1964). Jack Canfield, Chicken Soup for the Soul: Married Life! So beautiful! 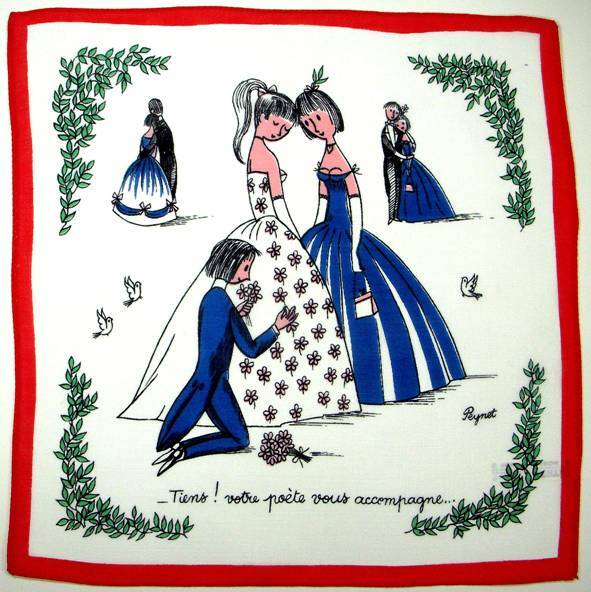 And sad I don’t have a Peynet hanky, I don’t think. Wonderful wisdoms quoted. I found a Paynet handkerchief in a handkerchief box made in the 1850’s. It’s been handed down from a Great Great Aunt. It shows a man in a boat singing notes and playing a mandolin(?) to a lady on the beach. It a bay with a peir and boats. The town is made of music notes, as is the little tree and the grass. It’s caption says “Canta Napoli!”. In one corner is trade mark (C) followed by raymond peynet – cesare perfetto. I know nothing about this, how it was made, where it was made, or when it was made. Any help would be appreciated. It is beautiful. I’m really not sure how to answer you as I’ve provided a great deal of Paynet’s professional background in the blog. I don’t have a specifics as to where handkerchiefs containing his images were manufactured other than what is here, but you might try the museums mentioned. You hankie sounds absolutely charming. I’m not sure knowing the provenance of manufacture would make it any more valuable. I believe it’s value would be determined by it’s popularity with collectors or perhaps scarcity of images. I wish I could be more helpful. Best of luck with your search.